The Best Chainsaw Sharpeners Available Now. Keep Your Saw Sharp! You’ve spent all this money on just the right chainsaw to get the job done in your yard, but unfortunately, the chain will not stay sharp forever. To continue receiving the best cut possible every time, you have to keep your chainsaw sharp. What better way to do that than with the best chainsaw sharpener? Not only will the right sharpener prevent overheating during use, but it will also lengthen the life of your chainsaw. That being said, there are so many available chainsaw sharpeners out there that you might not know which one will be the best for your specific needs. Consider different types, if a certain sharpener is compatible with your chainsaw, and of course what you’re willing to spend on any one product. From there, take a look at the list that I’ve put together in order to help you narrow down your options. Once you know exactly what you’re looking for, you’ll be able to choose the best chainsaw sharpener to keep your equipment in top shape for the next time you need it. This chainsaw file kit by Katzco may be a manual kit, but it’s so convenient that you won’t even think about electric models. This kit contains every tool you could need to keep your chainsaw cutting quickly and efficiently right within the roll-up pouch that keeps it all in one place. With such a huge amount of variety, the tools can be used on any chainsaw. On top of that, this option is affordable, finished with beautiful wooden handles, and has a comfortable grip that won’t hurt your hand. Even though this is a manual kit, people love how easy and quick the process of sharpening their blade was. As soon as they learned how, the blade was sharpened beautifully and in much less time than they thought it would take. The kit itself is also nice and compact, making it perfect to bring with you anywhere, especially since it has all the tools you might end up needing. The CO-Z sharpener is made of durable cast aluminum, with reinforced hinges that are meant to improve both the strength and performance of the sharpener. This electric sharpener has an adjustable angle and large handle for both easy operation and better control, with a built-in work light, along with safety guards to improve accuracy and protection. Make use of the tilting vise that accommodates semi-chisel and chisel style cutters, and watch as the grinding wheel lasts through the years. One of the best things about this product is that the device is intuitive and works exactly as you would expect. The design is both sturdy and sound, which is great when you’ve got to assemble it! Not to worry though, since assembly is easy, and if you do have any trouble, customer service is superb. You may have to get used to using a sharpener this powerful, but once you do, the time you spent cutting will be greatly reduced, saving you effort in the end too. You can sharpen your own chainsaw with this option by Buffalo Tools. All you have to do is mount it on a bench, wall, or vise for both easy access and stability, making your job a lot easier when you sharpen. One of the best things about this sharpener though is that it adjusts to almost any chainsaw out there, meaning that no matter what type of chainsaw you have, you can make use of this sharpener. Once you adjust to this sharpener, it’s incredibly easy to use. You only need to set the angle you’d like to use it and get going. It helps that it doesn’t take much effort on your part to sharpen each tooth, and even if you’re a beginner, the setup is simple. The sharpener itself is quite small, but don’t underestimate it. There’s a lot of power behind it, and since it is so small, it’s easy to store when it’s not in use. Granberg makes their Bar-Mount sharpener in such a way that it can quickly and easily sharpen any chain you might have in mind. Yes, that means that it mounts to any saw with any file size, so you don’t need to worry about this sharpener not fitting when you try and sharpen your chainsaw. It’s made of cast aluminum and zinc-plated steel, so regardless of how long you need it for, you’ll have a sharpener that’ll stand the test of time. One thing people love about this sharpener is that it really will fit any chain they plan on using it for. Thanks to the overall construction, it also gets their chainsaws as good as new, extending the life of their chainsaws enough that it’s certainly noticeable. It’s even easy to use, and just requires you to keep it in place while you use it. Take heart in the fact that if you do have any problems, customer service is wonderful, and is more than willing to help you through any issue. The high-speed motor in this electric sharpener operates most efficiently and quickly, saving you both time and effort when you start sharpening. The PC material cover is perfect too, since it is anti-aging and anti-impact. This makes the Timber Tuff capable of lasting for years without a problem, and keeps the entire thing cool when you’re using it so you don’t have to worry about any sort of overheating. Make use of 20, 25, and 30-degree angles to get exactly the cut you need. Even at such a low price, this sharpener certainly works wonders. People who have never sharpened their chainsaw love the guide that’s included to help get you started, along with the included file. Each tooth in your chain takes only about five seconds to get sharp, so you’ll be done with the entire chain in no time. If you want to figure out how to sharpen your chain on your own, after a little bit of practice, this is a perfect beginner option that’s even portable too. You have both top plate and down angle settings in this Oregon sharpener, allowing you to sharpen ¼ inches, 3/8 in low or full profile, or even .325 inches. Make use of that wheel wear indicator to let you know when you might need a replacement, as well as the built-in light for extra safety every time you use it. When you buy, you’ll get a dressing brick, a grinding template, and even three grinding wheels for sharpening too. This is definitely a more expensive option when it comes to sharpeners, but it’s solidly built and has good controls that more than make up for it. It works extremely well and is simple to use for those of you who aren’t necessarily very experienced. Even after years of using it, people note that it’s still working extremely well, and is likely to even outlast your current chainsaw! It’s so simple to use that you’ll wonder why you didn’t get one before. 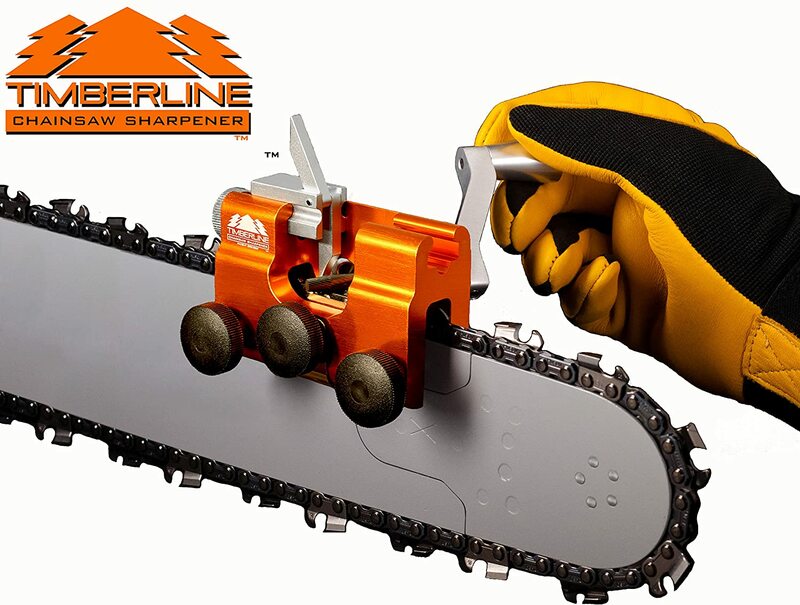 The Timberline Chainsaw Sharpener sharpens each tooth in seconds, giving you a precise cut that’s sharpened to the same length and angle every time. Not only does it provide a precise cut however, but is made of durable high-quality materials like machined aluminum, and is completely portable. No matter where you are, you can sharpen at any time. Thankfully, it’s simple to use as well, making it a great option for any user who wants professional results. One thing that sets the Timberline Sharpener apart from the rest is the fact that it provides such uniform sharpening that you will have a hard time finding another sharpener that works exactly the same. It’s easy to set up too, and simple to operate even for beginners. There are also fewer shavings, which is great when it comes to your safety. The more you use it, the better cut you end up getting! Pick out a Stihl that will work with whatever size chainsaw you have in order to get started. It will work on all types of chains as long as you pick out the proper sizing, even rapid chain types. Choose from the .325, 3/8, and 3/8 Picco and you’ll receive around 20 sharpenings until you need a replacement. With this in mind, both your saw and your sharpener will last a while and will continue to cut through logs like butter! Even if you’re a chainsaw novice, you’ll find this sharpener easy to use. People who have never sharpened their chainsaw before comment on the helpful symbols that are there to help you figure everything out. It should only take you about five minutes to have your chainsaw completely sharpened once you’ve figured out how to do it. This easy to use option by Oregon is meant to keep your chain cutting like it’s new. 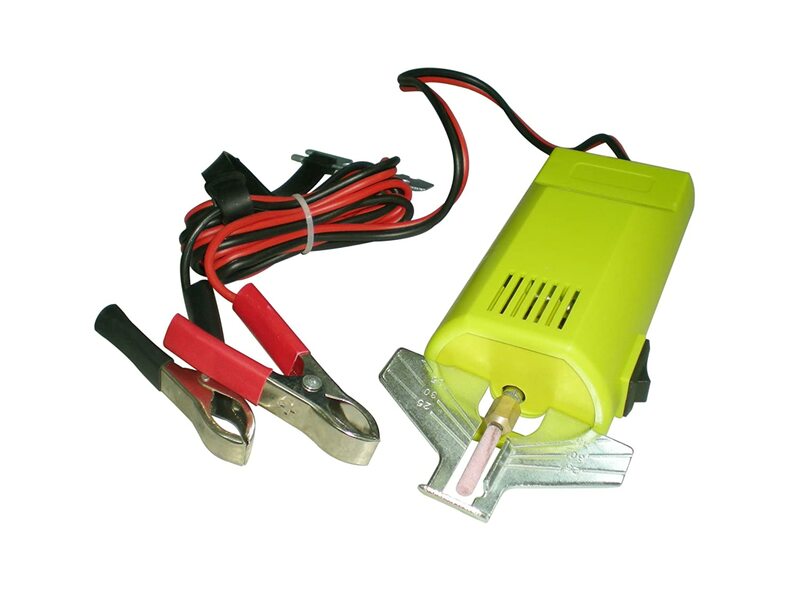 All you need to do is check the 12-Volt battery to transport it and use it out in the field, so it’s portable as well. Two sharpening stones are included, as well as a sharpening guide to ensure you make every cut uniform and just right every time. It’s great that this is at a great price point too, ensuring that you don’t spend too much money on your sharpener. It’s wonderful how quickly this sharpener works, so if you’re new to the process, you won’t need to spend too long figuring this one out or sharpening up your chain. It’s great how it runs off of DC power supply, so you can use it out in the field without worrying about the fact that you may not have an outlet on hand. As long as you keep it running at the correct angle, it’s simple to use and saves you lots of time. Safety is one thing that most people want above almost everything when they pick out a sharpener. It’s nice that this TruePower has a large safety guard so you stay completely safe, yet still has a powerful 8.5 amp motor with 4200 rpm. The chain rotation rollers help you set it up quickly too. When you buy, you’ll even get a 4-1/4 x 1/8” grinding wheel, and with a price point as low as this, you’ll be surprised you didn’t try this sharpener earlier. The price is only one of the reasons why people love this sharpener so much. Instead of constantly buying new chains, you can have your chain sharpened within 10 minutes with angles that you can adjust yourself for better cutting. Many chains even come sharper than they were when people first bought the chainsaw! With a couple of videos online to learn precisely how to use it, you’ll be the sharpening pro in no time. You now have the top 10 available options when it comes to sharpening your chainsaw, but how do you know which one will benefit you the most? It can still be hard to narrow down your list, so it’s important to have a few considerations in mind. One thing that’s important to know is that most sharpeners are all made to improve your experience. That means that they’re guided so you won’t make an angle mistake. Lots of chains even come with markings so you have the right file size or file setting. If you want to choose, choose more based on your needs, how often you plan on using it, and if you’re using your chainsaw closer to home or not. Think about how much you plan on using your chainsaw in general, and therefore how often you may need to sharpen it. If you’re only sharpening occasionally and are around home a lot, the hand-operated types are a great choice. You’ll need access to a vise to hold the saw blade though. On the other hand, if you’re on the go a lot and end up using your chainsaw a little farther from home, a portable sharpener meant to fit in your pocket may be your preferred choice. This way, it will always be available regardless of when you need it. Essentially, there are two main types of sharpeners: electric and manual. Manual sharpeners provide lots of accuracy and control over your sharpening. They even have a depth gauge that will allow you to get precise length and accuracy all along the chain. The only warning is that this can be fairly time consuming and effortful. By contrast, electric sharpeners offer the same end result, but with a lot less time. There are three types of sharpeners that you may want to consider. If you get a mounted or electrical, it will last longer, although a portable handheld type still holds up well, and doesn’t require any electricity. Depending on what you need, one might be a little bit better than the others. Let’s start with the Handheld Round File. This is the most common sharpening tool. It’s basically a round tool with a diameter that fits between the blade teeth to shave material away. Just be sure to have a specific blade diameter that’ll work with your chain, and remember that this is a manual sharpener. With this, you have to be careful not to sharpen one set of teeth more than the other, and have to try your best to get a uniform sharpening length. The Bar Mounted Guide isn’t a file, but a device that attaches right to the bar of your chainsaw. It can be adjusted to accommodate different sized files, so it usually produces very accurate results. Shavings tend to fly off though, so you will need some sort of protection over your eyes. The easiest types of sharpeners, by far, are the electric types. These are incredibly versatile, powerful, and efficient when it comes to sharpening your blades. They’re usually compatible with a wide range of blade sizes, and don’t need any more than five minutes to sharpen a 20” chain. This is actually one of the most important things you have to think about, if not the most important thing. If your sharpener is not compatible with your chainsaw blade, there’s no point in buying that sharpener! Not all sharpeners work with all blades, so if you’re uncertain, it’s better to consider sharpeners that are known to work with almost all blade types and angles. Yes, it is possible to sharpen your chainsaw by hand using a file. Hand sharpening is slow and tedious though, and requires you to sharpen at the proper angle with careful work so that every tooth on the chain is sharpened equally. With any sharpener though, there’s a guide that helps you sharpen at just the right angle. With the sharpener tool, you will be able to prolong the life of your saw. That’s because these tools are designed to hold the chain in order to create the perfect angle and best performance possible in your saw. I've got you covered if you're looking for the best chainsaw chain? For the best safety, follow your manufacturer’s recommendations when you can. This will help you get the proper chainsaw sharpener for your needs. These sharpeners have gotten a lot easier to use in recent years, so almost anyone can do it with instructions. That doesn’t mean you can ignore safety though! If you want to stay safe, be sure you have the proper protection when sharpening. That includes wearing gloves to protect from possible cuts from the chain, and wearing eye protection to keep your eyes safe from small metal shavings. If you’re using a bar mounted guide, this is especially important. This may sound obvious, but always make sure the chainsaw is not running either, and don’t sharpen it while idling. Any chainsaw should be fastened down properly when it’s being sharpened, especially when you’re using power-supplied sharpeners. With a hand sharpener though, be sure it’s on a stable surface. Check any adjustments at the same time too. There are quite a few available chainsaw sharpeners out there on the market today. From manual to electric types, you have lots of options to choose from. I picked out the top 10 that may benefit you the most, but you still have to narrow down your list depending on what will ultimately work best with your chainsaw. Choose one you think you’ll like best, and if you have any other comments or questions, be sure to leave them down below! Best Zero Turn Mowers Rated and Reviewed. Mow That Lawn!